None of us are ever going to hit a home run every time at bat. Don’t get discouraged. Keep swinging. If you give up and don’t go back up to the plate you will never get another hit. Life is not easy and certainly not fair, don’t give up, ever! And find a way! When you are defeated once, don’t give up. Many of life’s failures are people who did not realize how close they were to success when they gave up. Just going that extra inch can take you that extra mile. The difference it can make to yourself or someone else can be astounding. Many times you are having a terrible week, none of the task have been finished by you yet. But don't loose hope . Keep Trying. Stay motivated. If someone says you can’t, it is because they have not tried. Show them you can even if your inner self is saying you can’t. You will have at least tried. Fall down seven times, stand up eight. Therefore, maintain your efforts and pipeline the task daily– keep organized all the stuffs so as no prospect falls through the cracks. This is crucial for the growth of you – keeping track of those little successes we accomplished, achieved and setbacks at those opportune times! Do it now. Stay Motivated. We hope guys you find Quote "Never confuse a single defeat with a final defeat. 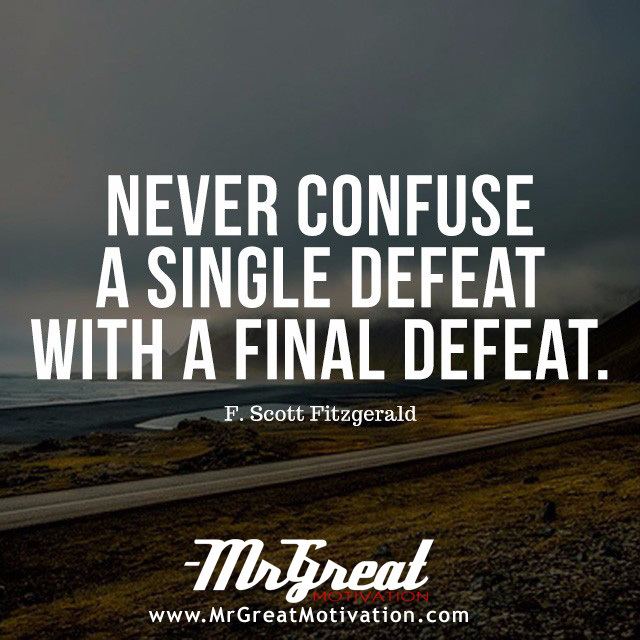 - F. Scott Fitzgerald" by Mr Great Motivations useful. If you think we have made some efforts, then don't forgot to appreciate us by sharing this Quote with your friends and family, And thanks for visiting.